Andy Flower and the England selectors have not been afraid to make big calls. James Anderson didn’t play in the World Twenty20, Kevin Pietersen was dropped last summer and Steven Finn left out during the Ashes after taking 14 wickets. They made another in Melbourne on Sunday when Paul Collingwood, England’s most capped one-day player, was omitted for the first match against Australia. Although Andrew Strauss said Collingwood remained firmly in their plans for the World Cup – the final 15-man squad will be named on Wednesday – he added that there would be no quick return. This omission wasn’t dressed up as rotation or resting, this was a clinical dropping because Collingwood isn’t currently part of England’s best one-day side. Melbourne loves a hometown hero. When Dean Jones and Bill Lawry were paraded around the ground during the fourth Test they were cheered to the rafters and all Shane Warne has to do is step foot on the turf to be hailed by the locals. Aaron Finch has a long way to go to match any of them, and may never play Test cricket, but for one night he gave the suffering Australia supporters something to cheer in front of his fellow Victorians. England’s victorious Ashes campaign was compelling enough in its own right to make sleep deprivation a palatable hardship. But for older cricket fans, who remembered the meagre fare of the BBC’s haphazard live screening of tours in the 1980s, the myriad opportunities to follow it seemed like a paradise, to paraphrase Philip Larkin, we dreamed of all our lives. Alongside the over-by-over coverage, the internet has opened up the possibility of listening to commentary streams from Australia to complement Test Match Special’s excellent coverage, particularly during the shipping forecasts. And those tuning in to ABC, particularly its Grandstand Reflections end-of-play wrap, will have discovered rich baritone voices and fresh, quirky insights. Paul Collingwood, the England captain, had never seen Chris Woakes bat before his match-winning innings against Australia in the opening Twenty20 and went on the advice of coach Andy Flower as to which position the debutant should take. 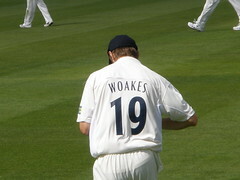 It proved another perfect decision from Flower as Woakes hit an unbeaten 19 from No. 9 to secure a one-wicket victory at Adelaide. Woakes, 21, earned his chance in the Twenty20 and one-day squads after Stuart Broad‘s stomach injury picked up during the second Ashes Test ruled him out of action until at least the World Cup. It wasn’t expected that Woakes would play a major role but he was given an outing against the Prime Minister’s XI in Canberra then preferred to Chris Tremlett in the Twenty20 side. Now he could yet be making a late bid for World Cup selection.